An unelected Conservative life peer in the UK House of Lords was quoted as saying, in part, that people who have chosen to ride a bicycle are “longing for” drivers to run them down because they are filming their ride. This inspired Bernard Davis to write a poem, reproduced below with his permission. The poem causes us to reflect upon the several killings recently of people who chose to ride a bicycle, including 3 at Bow roundabout along ‘cycling superhighway’ no.2 in London. (On a related note, the Metropolitan Police Commissioner Sir Bernard Hogan-Howe today had to backtrack on his personal remark that he wouldn’t want to cycle in London because it is too dangerous). Lord James of Blackheath is right. And live, but live in shame. We have already over 1,700 people saying on Facebook they want to come and join in. 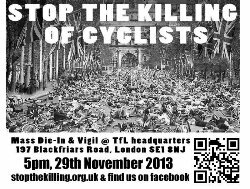 This means it potentially will be the largest Mass Cycle Die-In in the UK to date.